I have something to admit; and I never thought this would come to pass. After a motorcycling crash UCL tear (thumb tendon injury) I temporarily and almost permanently became….a……a…….console gamer. There I said it as shameful as it is. Being able to sit back on my couch with multiple ice pack positions was my only way to comfortably play video games during the multi month healing period. And on a nice large 65 inch 4K display with the awesome Xbox One S and Nintendo Switch the temptation to stay a console gamer forever was strong. I needed something to get that PC spark lit again; to get me back in the saddle. My driving rig (an Alienware 15 notebook with external graphics amplifier and Logitech wheel) was hooked up to a nice $300 screen I bought at Costco. An LG 30 inch ultra-wide. For Project Cars the LG had more than enough pixels to stress out my GTX 680 at 2560x1080, however the displays 60 Hz refresh rate (max overclocked to 75 Hz) caused noticeable stutters on replays; something that bothered me. My FPS/RTS/Flight rig (a DIY w/ GTX 1080) was running 4K on a nice 27 inch Acer. I had to dial down graphics settings to get my desired framerates in 4K. 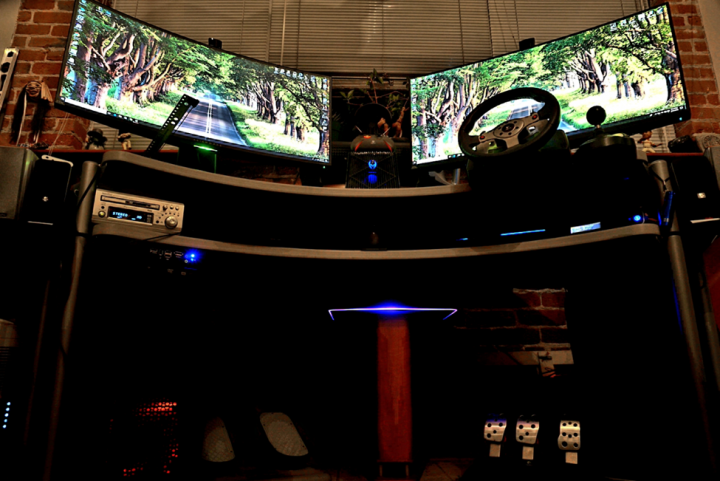 But the biggest problem (I am lucky to have) is that I own a curved desk. One should not game with flat displays on a curved desk! So I decided it was time to kick the tires and light the fires on PC gaming and my friends over at Alienware sent over two of their curved gaming displays. Now, there are many companies that make curved gaming displays and my colleagues at JPR have tested a few brands. Image quality can be similar amongst top products, so at some point it comes down to style, features, and brand preference. The old Benz vs Beemer vs Lexus conundrum. The Alienware displays have great style and are amongst the elite. The stands are metal and the customizable lighting is tasteful. For the driving rig I specified the 34 inch 2560x1080 model (AW3418HW) because I wanted the SPEED. Running at 144 Hz (and overclockable to 160) all the hiccups experienced in Project Cars panning replay scenes instantly disappeared into butter smoothness. So much it could be mistaken for a real race on TV to the untrained eye. And the 34 inch wide display allows maximum FOV settings; and with Natural Point TrackIR 5 head tracking?……..ridiculous immersion. Virtual Reality? Pfffffft. 34 inch ultra-wide with head tracking IS virtual reality in my book. I’ll take this setup any day over current top tier consumer VR for racing. I’ll even go as far as saying that every racing and flight simulation fan should be saving for a 34 inch (or larger) curved display. It’s that awesome. For the FPS/RTS/Flight rig, I had to go with the 3440x1440 (AW3418DW). Would the 2560x1080 still be awesome on this side? Of course. But as Jon always says about pixels; too many are never enough. This is especially true when the display is big enough for the pixels to be useful. I also have the horsepower to drive them at acceptable frames with my DIY overclocked Xeon (yes...a server processor being used for gaming) and mighty GTX 1080. Now, using the 3440x1440 ultra-wide as opposed to 4K I lost about 3.3 million pixels but gained a chunk of frames. But what I really gained was life. Or should I say the avoidance of death. What you CAN’T see CAN and USUALLY WILL kill you! I tested this display with Tom Clancy Ghost Recon Wildlands. This is true in all modern combat and goes back to Neanderthals seeing the saber tooth tiger or snake out of the corner of their eye at the moment of truth. The AW3418DW is also very fast at 120 Hz. Now I have to be honest, that I don’t think I need more than 60 Hz for FPS/RTS, and some of this display speed stuff is a bit of hype. I don’t play twitch eSports titles and in Battlefield I continue to smoke most of my gaming group who are running high refresh. High refresh is just not as important as it is in racing, flight or some eSports titles. Especially with my preference for stealth Special Forces style gameplay with lots of crawl/crouch patient ambushes and silenced weapons. But the good news is that for someone without a dual station gaming setup, the 120 Hz will take you anywhere you need to go. From combat in the jungles of Bolivia to the Nordschleife at speed in a racing simulator. In my opinion an expensive PC without a great display is a waste. I’d much rather have a great display with a mediocre PC if budget is a constraint. The Alienware AW3418DW can be found for as low as $1,100, and the AW3418HW can be had for $800. The specs. The AW3418HW has a sharp (in appearance, not brand) IPS panel with low blue light, a HDMI 1.4 and DisplayPort 1.2 input, is G-synch compatible, and has four downstream USB 3.0, one upstream USB 3.0, and a 3.5 mm audio out connector. The AW3418DW has a AH-IPS panel and has all the same I/O as the AW3418HW with the addition of a 3.5 mm in audio connector.